In the months leading up to summertime, my kids start getting crazy antsy. It’s like they’re turning into little balls of energy I can scarcely control. They start tearing around the house. I find myself wishing as much as they would that the weather would warm up enough already to go outside! But then summer comes, and my kids get bored a lot more quickly than you’d think! They chase each other around playing tag and other favorite games, and for the first few weeks, it’s an absolute blast. Then they run out of ideas. They get tired of playing the same games. That means I am still dealing with kids with a lot of excess energy! This can get to be especially trying during a barbecue or neighborhood party. So this year I decided I was going to take matters into my own hands! 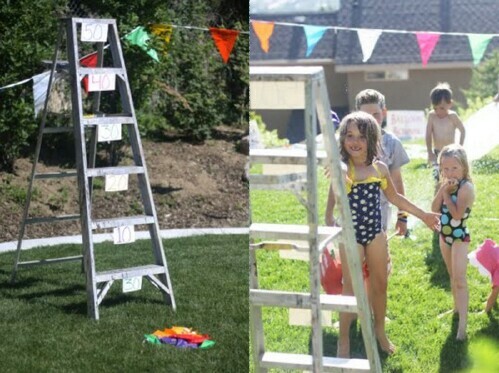 I’ve been scouring the web for the coolest DIY backyard games for summer. Some of these take some setup, but they are all pretty easy. My kids are more excited for summer this year than ever, and so am I, because this year I’ll be keeping them entertained! 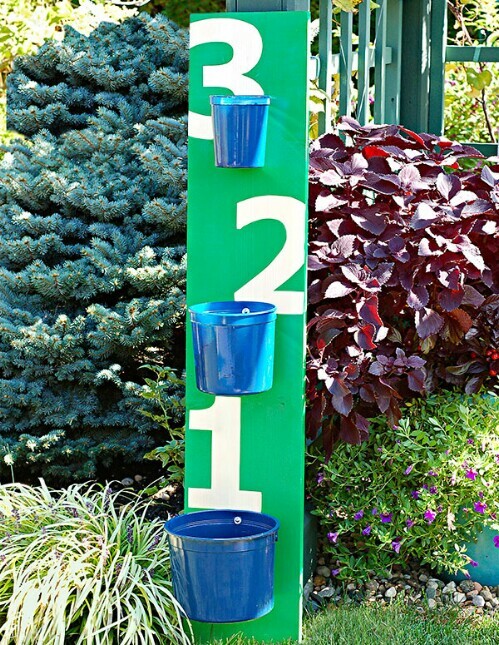 For more entertaining backyard projects check out our 70 Summery Backyard DIY Projects That Are Borderline Genius and our 20 Genius Summer Lifehacks That Will Blow Your Mind posts. If you liked the tic tac toe set that I shared with you earlier, you will love this one. 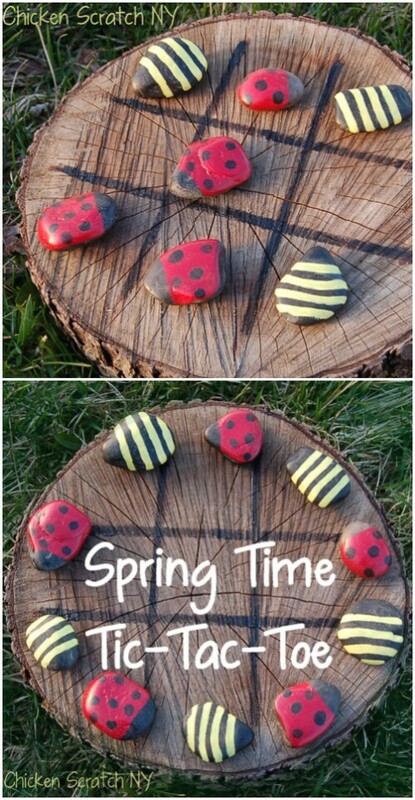 You just replace the X and O stones with cute little beetles and ladybugs and use a tree stump for the board. It’s got a cute summer theme! 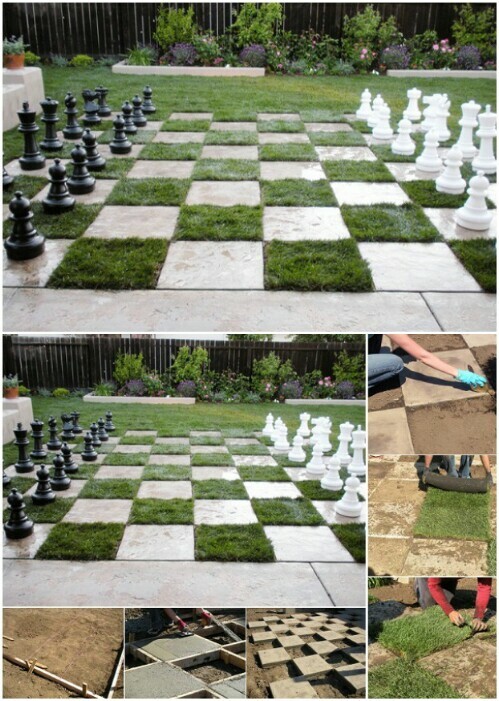 If your kids enjoy playing chess, they will love the giant outdoors version of the game. This is quite an intensive project, but once you have it set up, it be a lot of fun to play with, and it will also just look awesome! You can bet you’ll get a lot of compliments from neighbors and guests! If you liked the idea earlier with the plastic balls and straws, you can try building an actual giant Jenga tower with real wooden blocks. This would be a really fun game for both younger and older children! 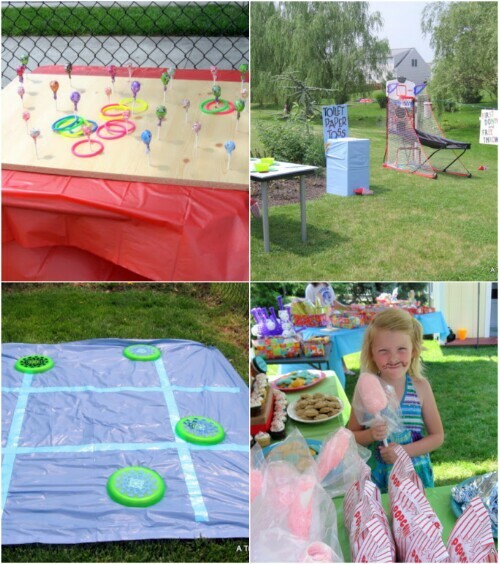 Be sure to check out the Sourcee link for instructions as well as a few other ideas for backyard games! There are backyard projectors and screens you can buy, but they tend to be expensive. 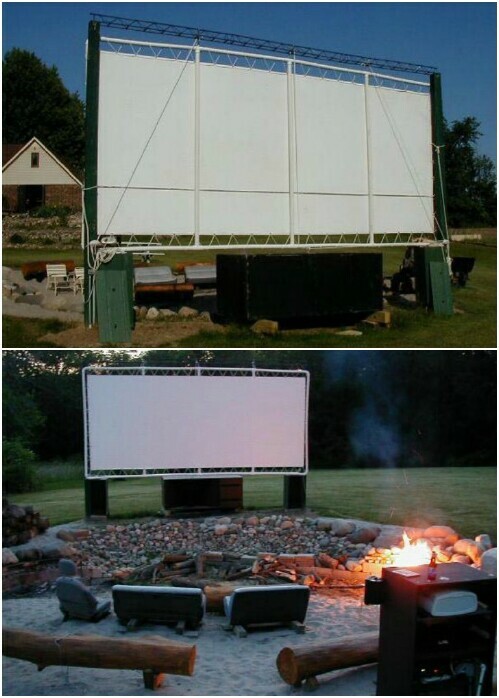 You can save money by building your backyard theater yourself. The screen uses PVC pipe and is durable enough to withstand even strong winds. Looks like a fun and cozy way to spend an evening watching movies! I still remember that during my childhood, an acquaintance with a tire swing was literally the envy of the entire neighborhood, and that her yard was the place to be. 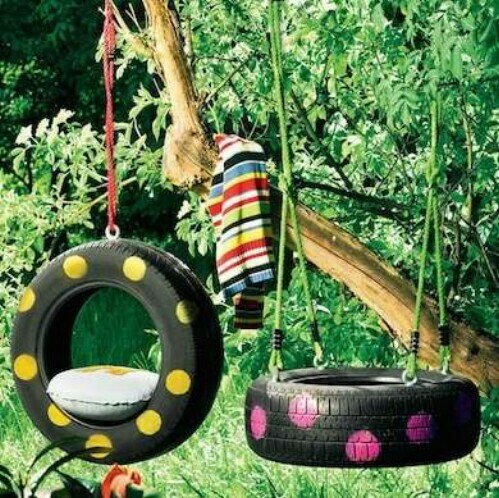 It’s surprising backyard tire swings aren’t actually more common, considering how easy they are to make. 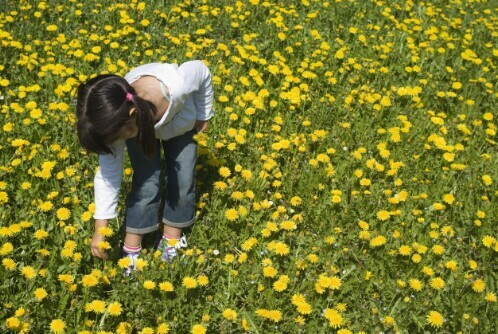 And you’re recycling, so this is an eco-friendly activity for your kids! I love how great these look embellished with the bright polka dots! If you own a ladder, you won’t need to buy any supplies at all for this project, which is awesome! Just tape points to each rung and challenge kids to throw bean bags through and see who can get the highest score. It doesn’t get easier than this! 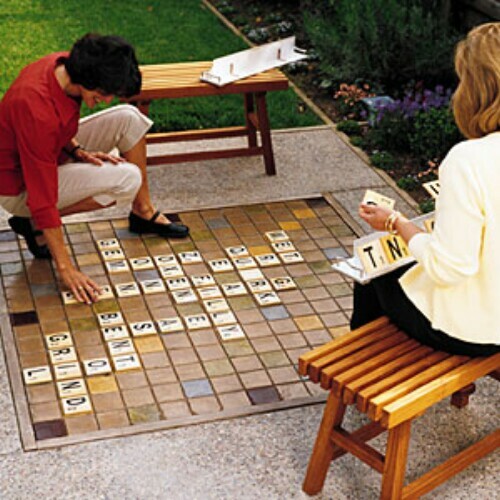 Make sure to check out the Sourcee link for a lot of other awesome backyard game ideas. Here is another ridiculously simple idea which will provide for endless hours of fun. Put up a chalkboard in your backyard. Provide a few colors of chalk and your kids will have an awesome time writing and drawing. Backyard bowling is always a blast. 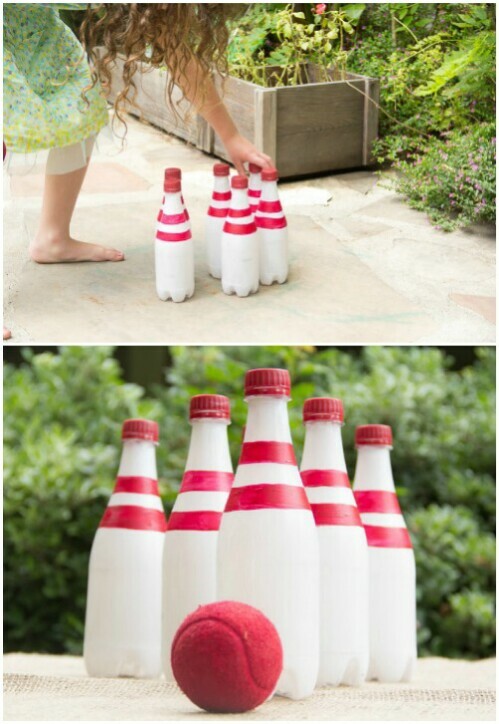 Instead of going and purchasing bowling pins, though, why not create your own set using recycled bottles? I love how these are painted to look like the real thing! 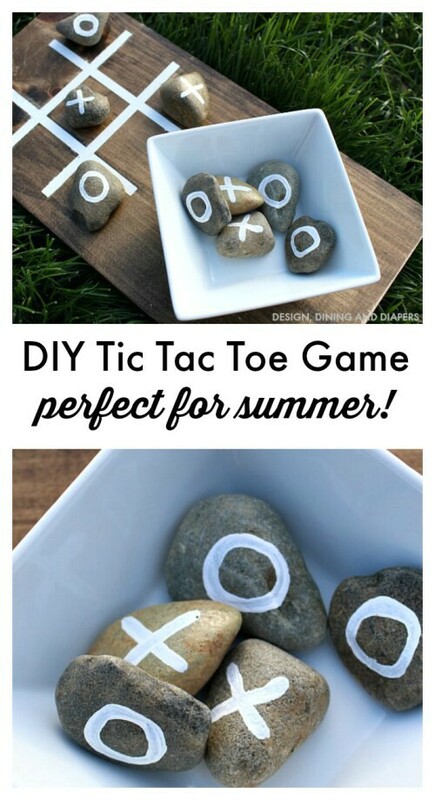 Here is a very simple idea for making an outdoor Tic-Tac-Toe game. You just use a wooden board and mark some stones. It’d take no time at all to make this, and it will provide hours of entertainment! Getting this set up would take some doing. The project you see pictured here involved creating a wooden frame and pouring concrete, then adding a number of tiles. The concrete had to cure, so this project took over a month, but the result is totally awesome. Reproducing this would require that you have some experience with this kind of DIY project, but your kids will love you for it. As it turns out, pool noodles are useful outside the swimming pool too! It shouldn’t be any surprise—they are colorful, lightweight, and versatile. But I never would have thought of setting up a target station like this one. 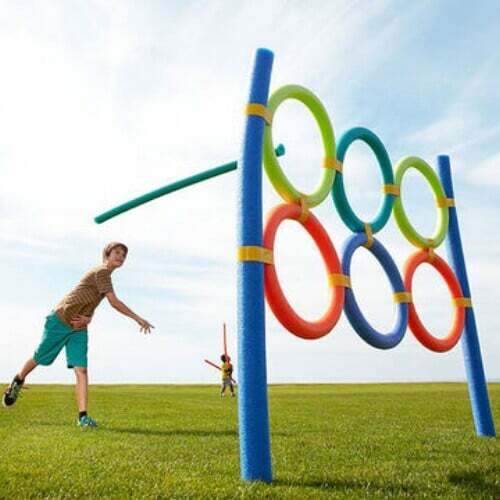 This is a great way for kids to practice their eye-hand coordination while having a blast! This game is pretty self-explanatory. Kids try to toss washer rings into the buckets. 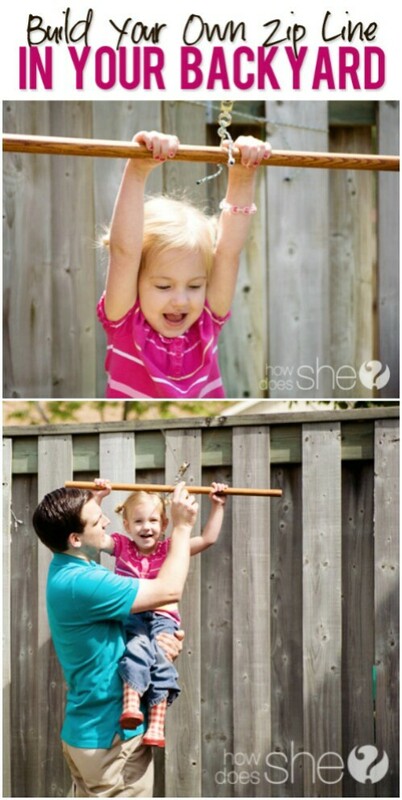 It’s easy to make and easy to play, and a great starting point if you’re still new to DIY backyard games. If your children enjoy making mud pies, then they should have a full kitchen to do it in! 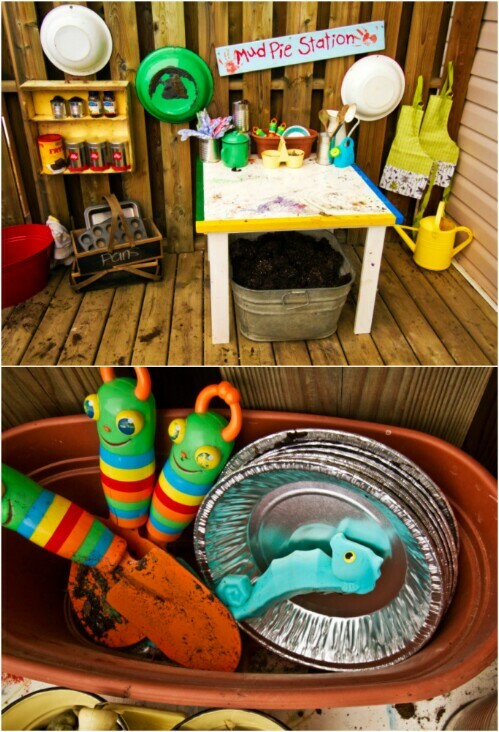 This mud pie station is pretty simple and straightforward, but it looks just awesome. Give your kids a full setup like this and they will spend hours out back having a blast. Here is another simple and fun idea for a similar activity which tests eye-hand coordination. 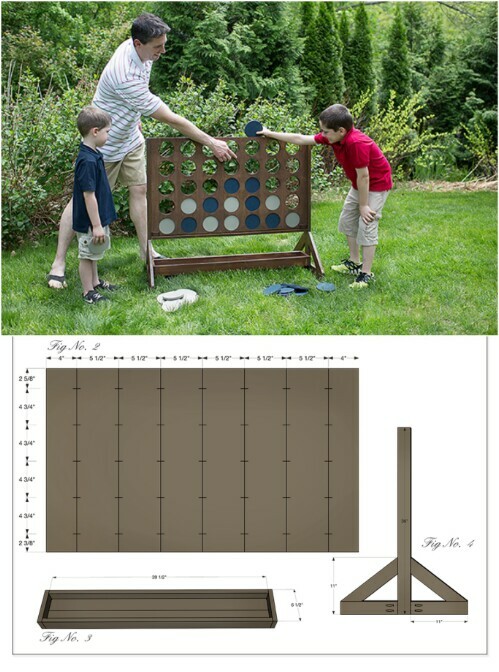 Kids who enjoy playing darts will love this outdoor version of the game. Instead of shooting at a target board, they take aim at a wall of balloons instead. Imagine the satisfying “Pop!” whenever they hit the board! You can even fill the balloons with papers with numbers on them which can be used for scoring purposes to make the game more competitive. This project is significantly more challenging than most on this list because it requires you to grab your tools and actually build a permanent lawn game. But for those among you who love hardware, that will only add to the fun of this project. Plus, if you have kids who enjoy DIY stuff, you can get them in on the crafting action! The finished game looks amazing, and you can enjoy it over the years to come! 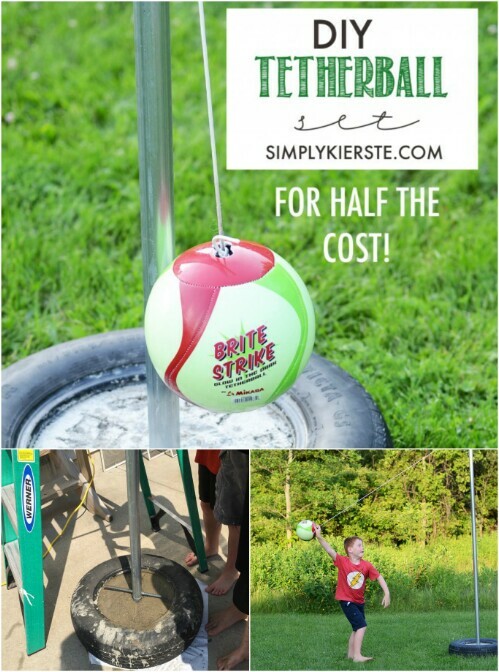 Do your kids love tetherball at school and beg you for their own backyard tetherball set? If you want to buy a set that’s pre-made, you can expect to shell out around $100. But you can make it yourself for around $45. This tutorial will run you through the supplies and the steps; it’s easy and the resulting set should be durable enough to enjoy for many summers! 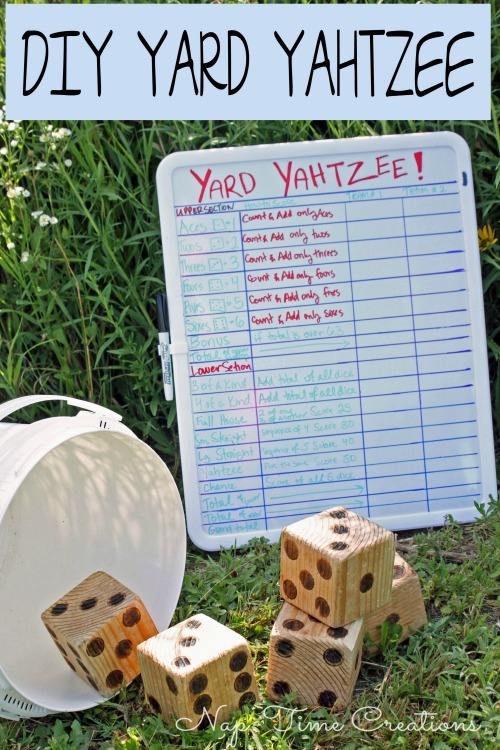 What kid doesn’t love Yahtzee? It’s a simple game and it’s easy to teach and learn, so it’s perfect for parties. But it’d be a lot more fun outdoors, don’t you think? Learn how to create a set with wooden blocks for dice and a couple of pails! If you have a child who loves going to the carnival every summer, you probably are inundated with “Can’t we go again?? !” a lot. Fairs can be expensive, so you probably don’t go back as much as you’d like. But now you can set up a carnival for your kid right in your backyard complete with a whole bunch of easy and fun carnival games! Check the link to find out how! If your kid has ever encountered a waterbed, you probably have discovered that to a child, a waterbed is not a place to sleep, but a toy. Well, this project is a little like creating a waterbed in the backyard, just without the bed part. 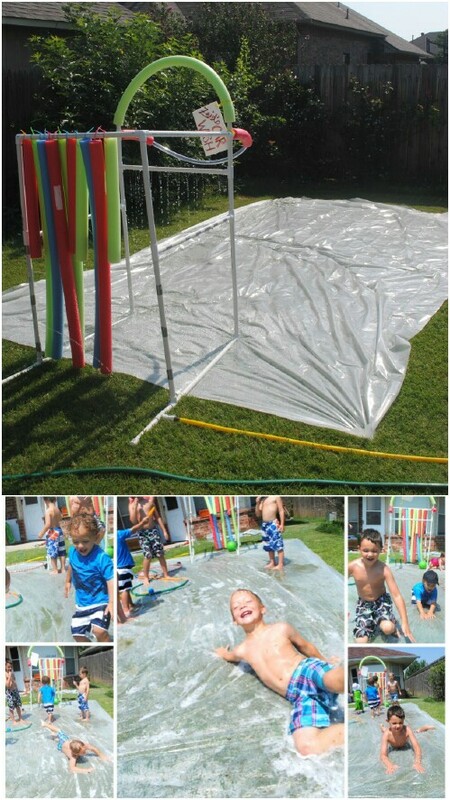 You’ll learn how you can fill a tarp with water for a ridiculously fun play surface your kids won’t get enough of! If you liked the idea above, your kids will probably have a blast with this too. 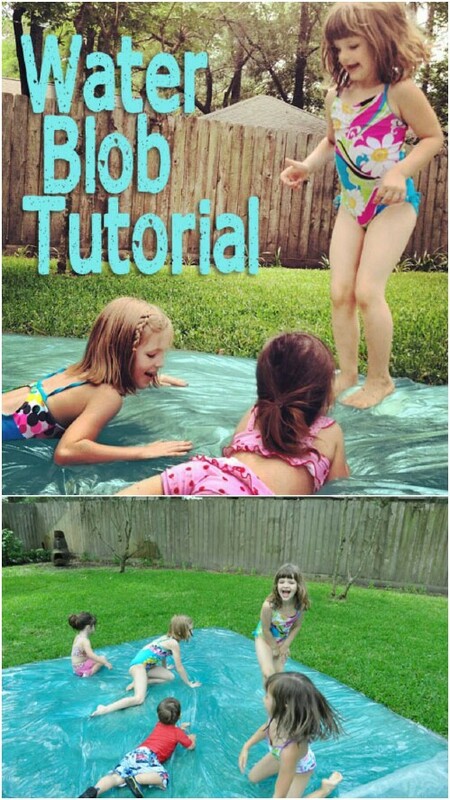 It’s an easy idea for a DIY slip & slide. There’s no actual “slide” part—it is all flat on the ground, but it looks like an awesome time to be sure! I imagine you could combine this somehow with the water blob idea for double the fun. 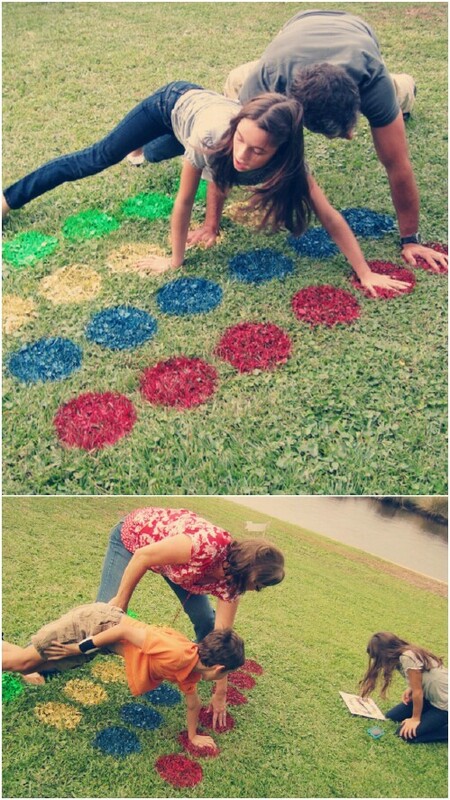 If your kids love playing Twister, you can set up an easy backyard version of the game without even bringing out the Twister mat. Looks like a lot of fun, and of course there is nothing to clean up! Have kids who love drawing outside with chalk? 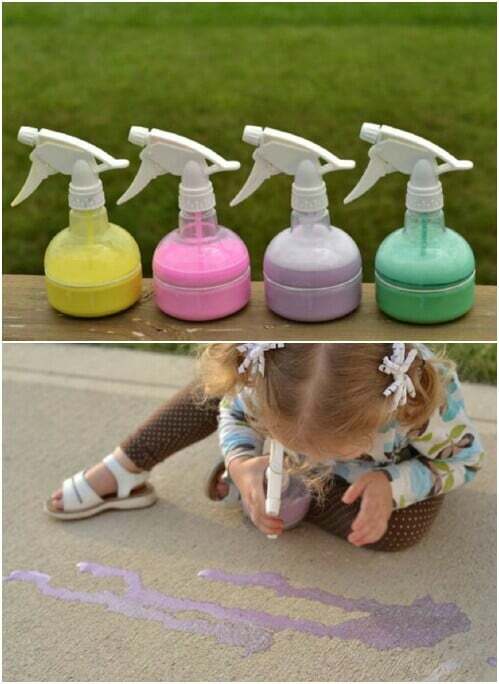 Now you can add to the fun by mixing some “chalk” spray. The ingredients include tempera paint, hot water, dishwashing soap, and cornstarch—you just mix them all together and put them in spray bottles with different colors. 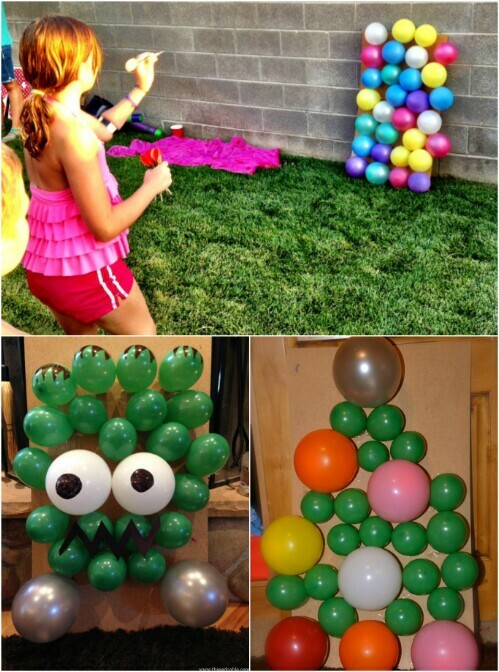 Let your kids have at it and they’ll have so much fun making designs. It’s a lot less messy than actual chalk! 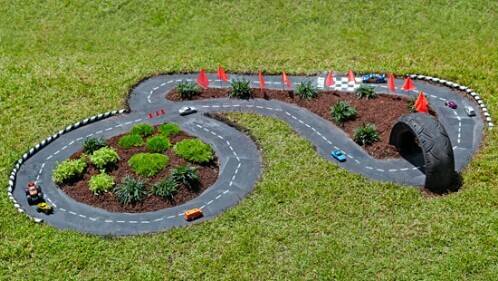 Wow, this little backyard racetrack looks absolutely stunning, doesn’t it? I can’t imagine how much fun this would be for kids to play with. You’d think it’d be really hard, but with a simple set of supplies and quick step-by-step instructions, it should be pretty easy to create your own. If you have crafty kids, invite them to help out. If you are handy, but do not want to jump into an overly involved project, you should find this DIY ring toss game quite approachable. You only need a few tools, and the steps are straightforward, quick, and easy. The game is also simple and makes a great choice for even the youngest kids! Here is a more involved hardware project—but still pretty simple when you think about it. All you are doing is attaching a tube slide to the top of your deck. It’s a smart design since you don’t need a full set of playground equipment; you are just making use of what you already have! 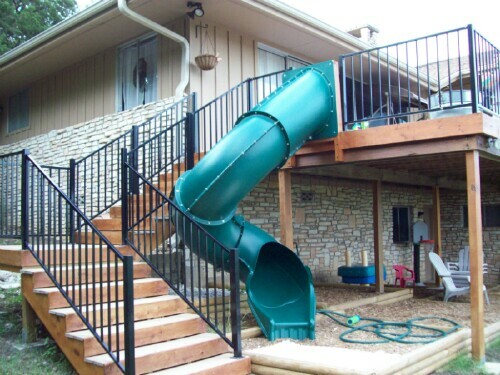 The stairs to the deck are right next to the slide in this picture, so no kids scrambling upstairs in the house. What kid doesn’t love a zip line? I remember when I was a kid, I couldn’t get enough of them! I always wanted to go to the park. Well, now you don’t need to drive your own kid to the park every week; you can install a zip line right in your backyard. It might sound hard, but with these instructions, it looks very accessible, even if you don’t have a ton of DIY experience. This is a particularly good game for small children as it’s a sensory play activity, which means it helps with child development at a young age. 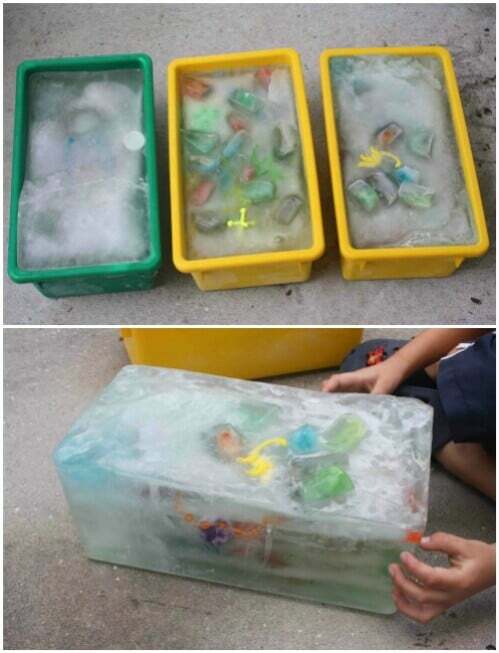 You just freeze a bunch of toys inside an ice block and let your kid chip away in search of the tools. Make sure you use durable toys for this, or they could break. This isn’t exactly a Jenga tower game, but it’s similar—instead of wooden blocks, you have a bunch of rubber balls stacked up with straws underneath them inside a tube. The object is to try to pull out as many straws as you can without having the whole thing collapse (just like the Jenga tower). Check the link for a step-by-step tutorial! This game is just what it sounds like. 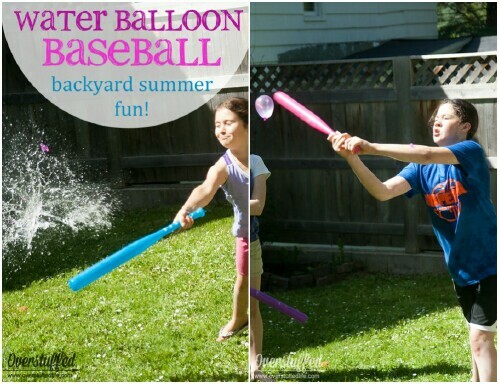 It’s baseball, but it’s ten times funner because your kids are playing with water balloons! Okay, to be fair, your kids will probably only be doing batting practice, not a full game of baseball, because the balls explode on impact. If you have a kid who loves really physical activities (and who doesn’t mind falling down in the dirt and mud now and again), a DIY obstacle course is an awesome summertime activity! 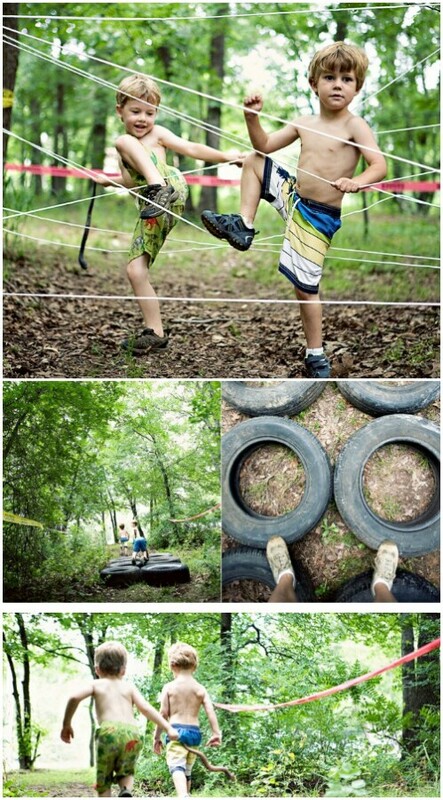 On Under the Sycamore, you can find some ideas for an obstacle course birthday party. Activities include running through tires and cardboard “tunnels,” and my favorite, the “tripwires” strung between the trees (pictured). This idea is pretty unusual, but it’s also pretty … well, pretty. You can tell your children to stop and smell the roses all day, but what better way is there to get them to actually do it than to have them weave vegetation through a natural “loom?” This is a great sensory play idea! 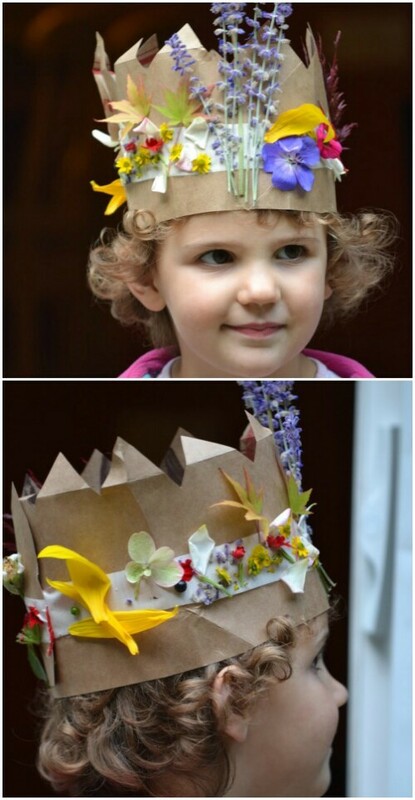 If you have a whimsical child, this activity to create “fairy crowns” could be a lot of fun! You just need some old grocery bags, tape, and flowers from the yard. I imagine that a crafty child could make a whole bunch of these in no time. They wouldn’t last very long, but they’d be really pretty while they did. So this isn’t a game per se, but it would certainly make it a lot easier to play house and other fun games in the backyard. Check the Sourcee link and you will find full plans to build the nook you see pictured. 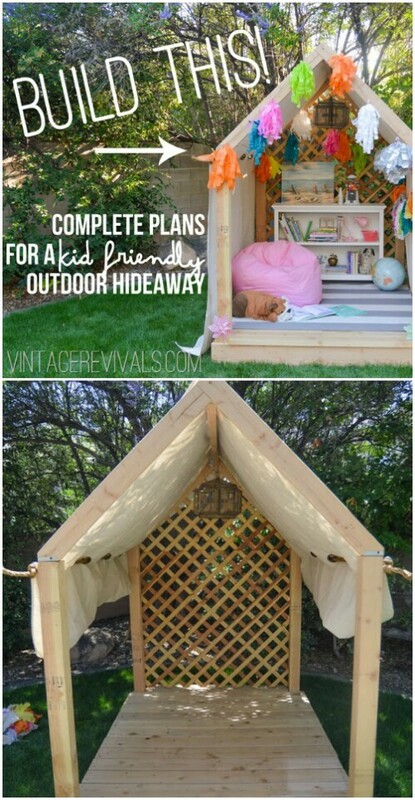 Personally I think this thing looks awesome, and ridiculously easy compared to most plans for kids’ playhouses, and so much less expensive! If you have kids who have an interest in physics or maybe talk about becoming engineers someday, this could be a fun way to teach them a bit about gravity and such. Basically you just have a wall of pathways which water can be poured down. 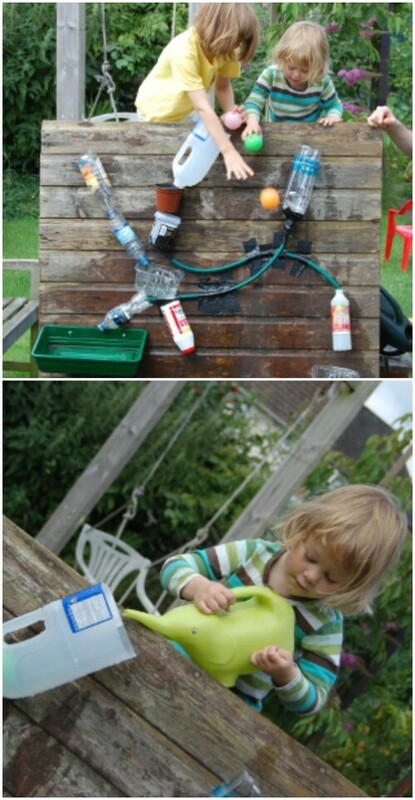 You can set up a bunch of tacks and grab some hoses and containers and let your kids develop their own pathways. 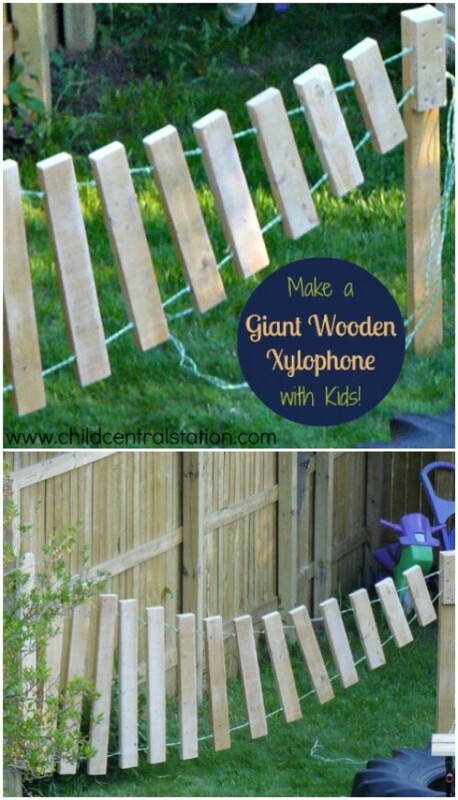 If you have children who are musically minded, one great toy you can build for the backyard is a giant outdoor xylophone. You will find a full set of instructions at the link! 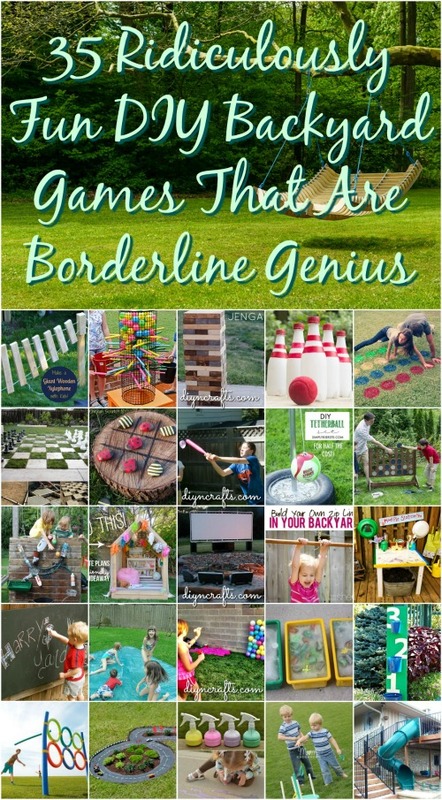 Now you have a lot of great ideas for backyard games, activities, and toys for your kids. With these fun projects ahead, this summer easily promises to be the best one yet. Know of any other cool ideas that we haven’t included here? Share your most exciting discoveries with us in the links below! Be sure to show us your own finished projects as well! Our readers can always use more inspiration! These are some really great ideas that we can actually afford the materials and do the work too. Thank you so very much for sharing! FYI the “Jenga Tower” game is actually called KerPlunk. It was my favorite “indoor” game at my grandma’s when I was a kid! . Thank you! I thought the same thing. 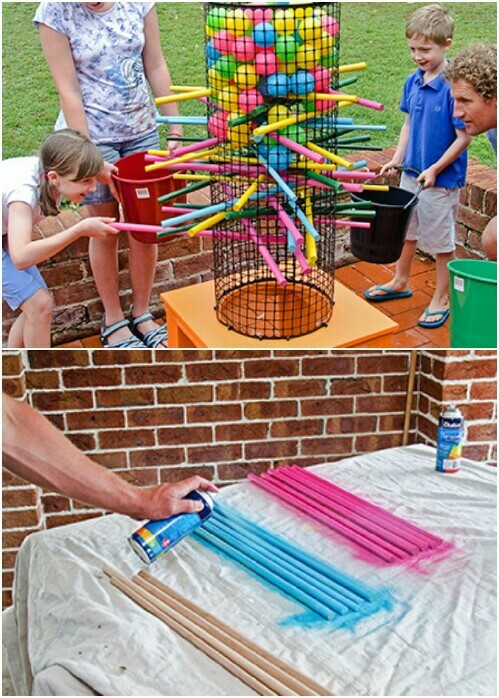 My daughter and her friends loved playing “KerPlunk”( I did too, LoL!) I also wish that they had websites like this back when I was doing daycare. 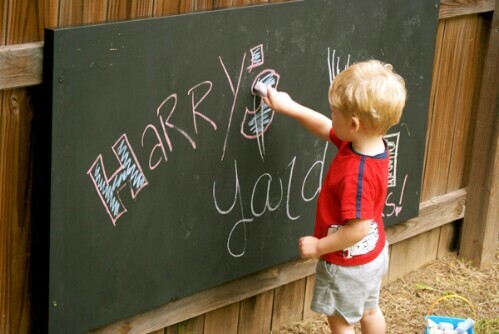 So many good ideas like the “Indoor & Outdoor Chalkboards” (keeps them from writing on the walls). I’m going to share this with my other daycare mom’s. The “Jenga Tower” as you put it, is actually a game… it’s called Kerplunk.